It is our pleasure to write the blog articles that we post. We enjoy providing valuable and helpful information to our clients and those looking for a Commercial HVAC solution. Serving our clients well is the top priority for us at Springbank. We have worked hard to become the company that we are with the people that we have, and we are very proud. If you are looking for a Commercial HVAC company to work with, here are a few reasons you should consider us at Springbank Mechanical. Our founders, Gregg Little and David Parr, opened Springbank Mechanical in the spring of 1990. They had a powerful vision for the company; to offer a superior customer experience along with technological innovations that offer maximum HVAC performance. The level of expertise possessed by the team at Springbank are second to none. Springbank has empowered their apprentices with the skills, training and support needed to be among the best in their field. This high standard and investment in employees has allowed Springbank to work with clients such as Canadian Tire, Loblaws and Cadillac Fairview. We strive to provide our customers with honest, reliable, quality service at competitive prices, every time. 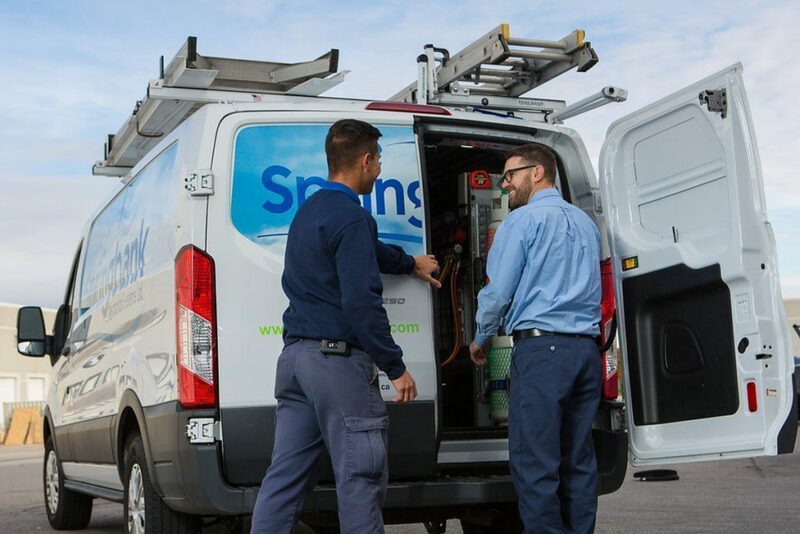 With over 50 service vehicles on the road at any given time, Springbank is able to provide a speedy response to service requests that you would not get with other Commercial HVAC companies in Ontario. We understand how a poorly or non-functioning HVAC system can negatively impact your company’s bottom line, and we take that very seriously. Call us with a need, and we will be there. Read More: Why Choose Springbank? It is our goal to hire employees who are not just skilled and technically proficient, but are friendly and excited about helping our clients. When you speak to a Springbank employee they will be happy and willing to help, and will explain things in a clear manner. We at Springbank understand that when it comes to hiring a Commercial HVAC company, you have choices. This why we not only want to provide the best service possible for our clients, but the best possible pricing as well. Our estimates are competitive within the industry and we pride ourselves on our transparency about estimates and billing. Unlike other companies that you may encounter, we are a full service commercial HVAC and refrigeration company. We offer installation and maintenance services for our clients with commercial, retail and refrigeration needs. We’ve got you covered from planning to execution to ongoing support. And we are fully certified to do so. We at Springbank Mechanical, a Mississauga Commercial HVAC Services Company, are ready to work with you and maximize your HVAC experience. Call today to see what Springbank can do for you.